LOS ANGELES. Boxing trainer Freddie Roach’s chief assistant Marvin Somodio said IBF superflyweight champion Jerwin Ancajas is up against a durable challenger when he battles unbeaten Jamie Conlan at the SSE Arena in Belfast, Northern Ireland, tonight. Somodio, who has lived here since moving from his base in Baguio to work with Roach at the Wild Card Gym five years ago, said Ancajas might need a knockout to retain his crown in Conlan’s hometown. But he said the Filipino titlist has what it takes to get the job done. The referee for the fight will be Steve Gray from Springfield, New Jersey. The judges are Filipino veteran Silvestre Abainza, Julie Lederman from West Nyack, New York and Dave Paris from Walk Woodlesford, Leeds, UK. The IBF allows a judge from one fighter’s home country and another judge from the other fighter’s home country to join a neutral judge in the panel. In contrast, the WBA insists that all three judges come from neutral countries in world title bouts. It will be Abainza’s first trip to Ireland and first assignment with the IBF. Abainza, 64, is a long-time licensed WBA referee and judge. Abainza has never worked a fight with Gray before. Ancajas and his manager Joven Jimenez left Manila for Belfast last week. Abainza was advised of his assignment late but managed to obtain his UK visa in time for his departure last Wednesday. He will also be a judge in the IBF Intercontinental superfeatherweight title bout between Jono Carroll and Humberto de Santiago in the undercard. Ancajas, 25, will make the third defense of his IBF belt. His record is 27-1-1, with 18 KOs, and he has won his last 14 outings since suffering a loss by majority decision to Mark Anthony Geraldo in Cebu in 2012. Conlan, 31, has a 19-0 record, with 11 KOs. His biggest win was when he survived knockdowns in rounds three and seven to stop Nelson in the eighth with a body shot for the British Commonwealth superflyweight crown in Hackney Wick last year. Somodio, 33, is now busy training WBO lightmiddleweight champion Miguel Cotto for his farewell fight against Brooklyn’s Sadam Ali at Madison Square Garden in New York City on Dec. 2. Last Saturday, Somodio supervised Cotto’s sparring at the Wild Card Gym while Roach attended to superlightweight contender Jose Ramirez’ fight against Mike Reed in Fresno. Ramirez, who is also trained by Somodio, scored a second round knockout to seal an appointment with Amir Imam for the vacant WBC 140-pound title in Fresno on Feb. 16. 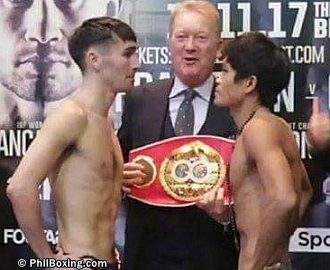 Photo: IBF world champion Jerwin Ancajas of the Philippines (R) and his challenger Jamie Conlan of Ireland come face to face during Friday's weighin.